Sarah Gillespie’s latest paintings are works of dust and shadow. Intricate and delicate drawings that capture in remarkable detail the natural world of the south Devon landscape where she lives. It is a world of dancing atoms and temporal fragility, of moths, blossom, hares and birds, whose cycles of life and death so often remain invisible to human eyes, hidden within the enormity of the landscape or the dark of night. In the summer of 2011 Gillespie began to work on a large charcoal drawing of an old yew tree engulfed in clouds of white cherry blossom. At the centre of the image is the dark silhouette of the ancient tree, its branches forming a tangle of light and shade. In the background a soft grey haze contains the ghostly presence of a distant woodland. This is a transitional work that marks the beginning of a new direction for Gillespie uniting the two strands of her practice. 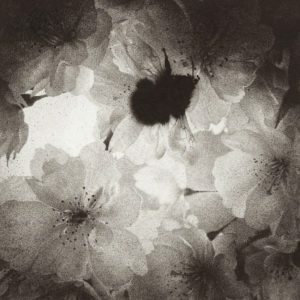 The foreground blossom reflects her recent life studies of ephemeral objects: birds eggs, dead bees, moths, and blossom, whilst the background echoes her earlier landscape paintings with their careful exploration of the effects of light on water, the passage of time, and the play of shadows. All Gillespie’s works are born out of the same process of long looking and close attention to the smallest detail as her gaze caresses an object or landscape. Through this act of visual interrogation the world’s hidden qualities and inner moments of beauty are revealed. These are works of black and white and the subtlest shades of grey, which demand a different form of looking to the immediate win offered by more overt colours. It is a celebration of frail beauty, fleeting pleasures, and the delicate colour of a shadow. This act of visual touch is reinforced by Gillespie’s physical touch. As she gently positions the moths that have become a recurrent subject in recent years an iridescent dust from their minute scales coats her fingers. Holding a dead bird or hare she feels their fur and feathers between her fingers, the texture and weight of the individual filaments and barbs that are usually invisible. And then as she draws, her fingers become black with charcoal dust; the ancient carbon atoms of the tree mingling with her own. Unlike oil paint which traps pigment onto the surface of the canvas, charcoal forms a subtle haze that allows Gillespie not only to capture the mist of moth dust, but the invisible cloud of atomic particles that our gaze passes through on it’s journey through space to the vanishing point of the distant object. This sense of connection emerges in the works themselves. They have a truthfulness that is not about technical fireworks, but an honesty to the subject. The dead birds, bees, and wild animals that Gillespie depicts so lovingly are not the result of a fascination with death, but because the depiction of an animal in life is always a fiction, the mind’s attempt to capture something which is impossible. We can never see a bees’ wings, or the fuzz of its fur. A moth always hides in the shadows, whilst a hare is either hidden in its form, or glimpsed as a sandy blur in the distance. It is therefore only in death that she can draw them, not with the taxidermists desire to imitate life, but as an honest response to the textures and forms that she still finds in this lifeless matter. Yet through the faithfulness of her vision and the ‘loving’ nature of her gaze, she somehow manages to imbue them with life and vitality. If ‘Cherry and Yew’ is a transitional moment, then ‘Oaks and Light Snow’ might be seen as a glimpse of the future. This gentle drawing is reminiscent of her previous landscapes in its unassuming subject matter, a hillside field framed by a latticework of trees and bushes. Lightly dusted with snow, its surface is crisscrossed and patterned with ancient herd tracks. Although this is an ostensibly empty environment, Gillespie’s intimate drawings of hares, moths, insects, and nests allows us to name and know its inhabitants, who are always present but rarely visible. We may never see this hidden world as we walk through the landscape, but it is always there, despite our blindness.